I love to make easy recipes, especially when they look and taste unbelievably delicious! One of my favourite chefs of all time must be, Donna Hay. She captures the most wonderful recipes in such a simple and easy-to-follow manner. I can truly recommend her cooking books. Why not borrow a few of Donna’s recipe books today from our libraries? I can also guarantee, that you will love the following cake; it is extremely light and delicious! Place the oil, eggs, rind, lemon juice, yoghurt and sugar in a bowl and whisk to combine. Sift over the flour and stir until smooth. Pour the mixture into a greased 24cm fluted ring tin and bake for 35 minutes or until cooked when tested with a skewer. 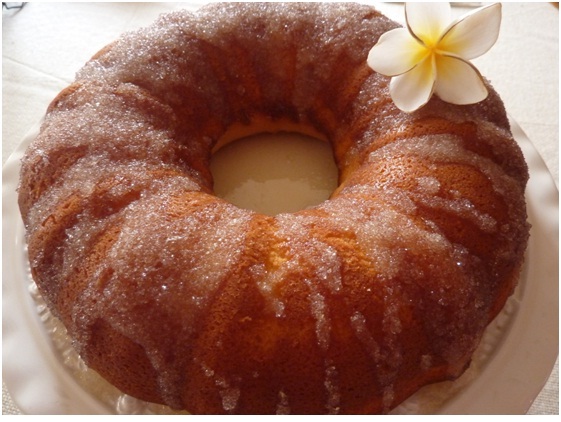 While the cake is still hot remove from the tin and place on a plate. To make the lemon frosting, gently stir together the sugar and lemon juice. Spoon over the cake and allow to set. Serve warm. Serves 10-12. Note: The hot cake sets this simple icing to an amazing tangy, crystallised crust. Just try stopping at one piece. This recipe can be found on page 176 in Fast, fresh, simple : 160 fast recipes, fresh flavours and simple standbys for every day and any occasion recipe book written by Donna Hay. PreviousCockburn Libraries online services will be temporarily offline.